If you're the proud parent of a dog or cat, then one of your most significant challenges is probably the endless collection of hair around your home. Unlike clothing, you can’t toss furniture in the wash to get rid of pet hair. As a leading dog trainer and behaviorist for cats as well - in the Greater New York, NY, area, - Sharon Mear's Training Cats and Dogs understands the frustrations pet parents feel when dealing with excess hair on their couches and chairs. 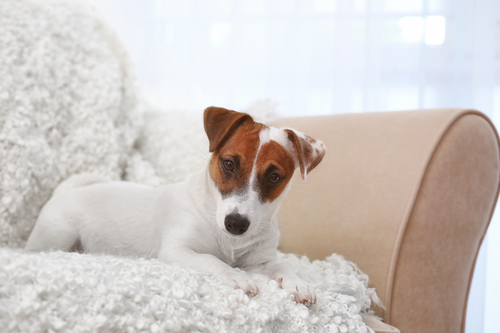 Below, this pet training expert offers her top tips for eliminating pet hair on furniture. As a pet owner, a lint roller is your most valuable tool. Not only is it helpful for your clothing, but it's also one of the quickest ways to get rid of pet hair when you don't have time to vacuum. You should also utilize special shedding brushes daily on your pet to help eliminate excess hair and keep their coat healthy. Ask your groomer which combs and brushes are best suited for your particular breed of cat or dog. You can avoid constant cleanup by covering furniture when visitors aren't present. Use slipcovers or throw blankets to protect seating and chair or couch arms, and when company is coming, remove them for clean, hair-free furniture. Hair will stick to the coverings, but most options are washer and dryer friendly, so throw them in the laundry when they gather too much hair. You can also avoid the problem of hair on your furniture altogether, by working with a professional dog trainer, who can help you teach your pup to prefer his bed to your couch. Your furry friend can be taught to stop jumping on furniture. If you're having trouble getting your pet to behave, turn to Sharon Mear's Training Cats and Dogs for professional assistance. This experienced New York City dog trainer and behaviorist offers more than 18 years of certified experience. She'll work to determine the type of training and areas that need focus. Contact her today for an in-home consultation by calling (212) 727-2871, or learn more about Sharon and her accreditation online.